Our adventure started at the aptly named Culi Cafe, the shop where we purchased our tickets for the Halong Bay extravaganza. Halong Bay is one of the main sites of interest that we had pinpointed before coming over. 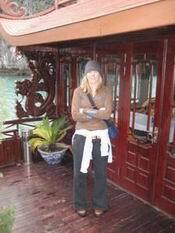 Through a couple of bit part conversations with the lady selling the tour we decided to go for the expensive option of $85 for two days and one night tour on a traditional Chinese Junk sleeping upto 32 people. And it did not disappoint. Our rendezvous time was 7:30am at the Cafe with the incentive of a free breakfast. All prepared for the trip we boarded the bus about an hour late, buses tend not to travel on time in Vietnam, personally I like the idea but the Lady Dr traveller seems to keep time a lot more. The bus weaved it's way through Hanoi madness and out onto the open road, it was a breath of smoggy air to get out of the city and into a slightly more rural feel. However sporadically we would pass through generic looking towns that all seem to sell exactly the same things. Thit Cho and Thit Meo are on the menu board which is a Dog or Cat stew, sorry Wendy if you are reading this, cover your eyes. The towns were quite depressing, houses ranged dramatically with some looking like skyscraper palaces and others being engulfed with coal dust. Factories were dotted along the main street with the traditional communist flags outside, all very regimented, everything has it's place. Mostly it was countryside with paddy fields and conical hat wearing women picking the rice in the rain, and buffalos pulling traditional ploughs. In the backdrop were hills covered with palm trees. But it was still raining. After a three hour long bus journey we arrived at Halong Bay, the weather had now turned from a light drizzle into a heavy rain, the kind you get when Dunc starts to eat after cooking, whooa that boy can sweat. We had made a few introductions along the journey and looked forward to stay at a bit of luxury, travelling is tuff you know. Once we had boarded the smaller boat that we take us out to the liner (small Chinese junk) we started to realise that the climate for the next couple of days was going to be cold and wet and colder still. The only thing that would bring us around would be our arrival on what would be home for the next couple of days. A beautiful crafted wooden Chinese junk with three levels, restaurant, sundeck (not going to be needed) and AC cabins for all 11 of us. Yes the boat was slightly under utilised with only a third of it's capacity working, a bit like the inside of Marco's brain on a good day or similarly Brian Ashtons options after a drummin in his back garden (another referal to Powell's late night money making schemes). We had a welcoming party that looked like they were dressed out of one of Agatha Christie's murder novels and presented with a hot toddy to settle us into the cruising mood (too many jokes, not enough time). Our cabins were presented to us, all on suite facilities. We were oredered to lunch to be presented with a four course meal starting with fresh crab, not the kind you have to go to the green door for, but beautiful crabby crab things. Firstly how do you eat this stuff? The rest of the dinner and also the food on the whole trip was five star and in such wonderful surroundings. The captain, I mean very young chap in strides, sailed us to the caves where we would get off the main boat and arrive at a horseshoe shape formation to vist and admire. Me and the travelling Dr lady realised that caves are not our thing and hurried through the tour, yep, yep, whatever. Then kayaking, not this is a bit more of our area. Me and Em jumped into a double kayak with the rest of the group and travelled around several of the limestone pinnacles. I want to stress how amazing this place is, it has 1996 karsts, some huge and other rather small and uninteresting ( a bit like Bakers conversation after a heavy night out- wine anyone?). Back on the boat we got showered, changed.. and stuck into a few beers over dinner. All through the trip the group we were with gelled really well but a couple from Canada shared all our meals with us, not literally (the Ovenstone's don't share food). They were great couple and kept us entertained for hours, or did I just talk at them for a long time until they fell asleep and threatened to jump overboard if I kept on talking. Any who, they are now attached to the blog so I have to say that we liked them (joke Amanda and Darren). After a good night sleep we were into day 2 and visiting the floating fishing village where the highlight was a series of rowing boats coming out to meet us with the family rowing them with their feet, now it may not sound that much but I know that all of you reading this are no Steven Redgrave. It was impressive and something that took our mind away from the cold wind. We arrive back at our port just for lunch in the local plush hotel and the our repeat journey of three hours back to Hanoi. This was one of the highlights so far, a real great place to visit and nice to meet such good people and to be treated so well. Something that we get at no 71 and no 7. So there we go, I have rubbed all of the skin off my fingers and I don't think there is another word that I can use out of context in the English language, so it has been nice chatting or in my mind monologing.